Happy Friday and Happy Good Friday ;) Ilina here taking over My Sweet Petunia blog today. I know it's not Tuesday, but we do have whole month collaboration with Joy Clair, and we are showcasing projects using both companies products. 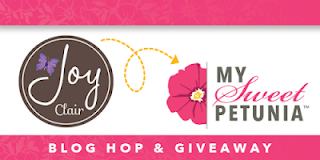 Plus if you leave a comment whenever you see this banner you will be entered to win our prizes: 2 $25 Joy Clair Gift certificates and one MISTI - your choice of original or mini. 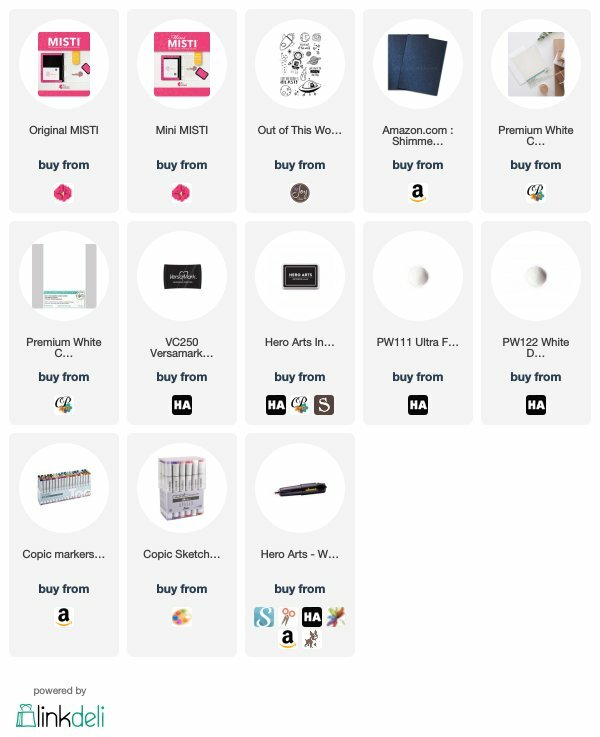 Winners will be announced in April on both blogs. For my card today I used the set called Out Of Space. I stamped the images using my MISTI and Intense Black ink, then colored them with Copic markers, put them back in my MISTI and overstamped with Versafine Clair ink then embossed with ultra fine embossing powder. And I used some patterned paper for the background. I love everything space/galaxy, so this paper was must have as an alternative to creating your own galaxy backgrounds especially when you are in a time crunch.. Awesome card, Ilina! Love that cool background paper! love this card. I want to try to make this background. I am waiting for my spaceman stamps to come. What a fantastic card! You achieved so much depth in your background and in the focal images - amazing. How cute! I love the starry background. The astronaut is really cute, too!!! I love this Ilina and what a sweet set! My grandsons are here and have given it THEIR 'stamp' of approval! They said "ITS GREAT"! So if a 4 & 6 y/o love it, it must be great! Wow! That's some awesome coloring! The background paper looks beautiful with the scene you've created. Fantastic card! The solar system is fantastic. Awesome background - Love to see new designers! 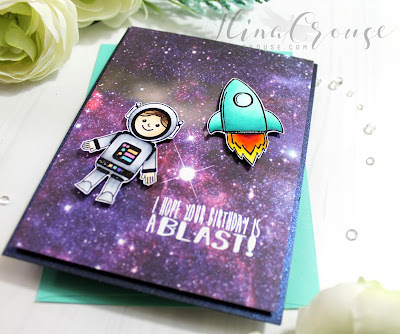 Wow.....what a wonderfull card with that fabulous outer space backgroundpaper. Oh my goodness!!! This galaxy background is simply breathless!!! Great background for the galaxy, the images are so cute, I've not come across this company before in my short craft journey, thanks for introduction . An adorable space stamp set, looks great with the background paper you used. I think my grandsons would love it! 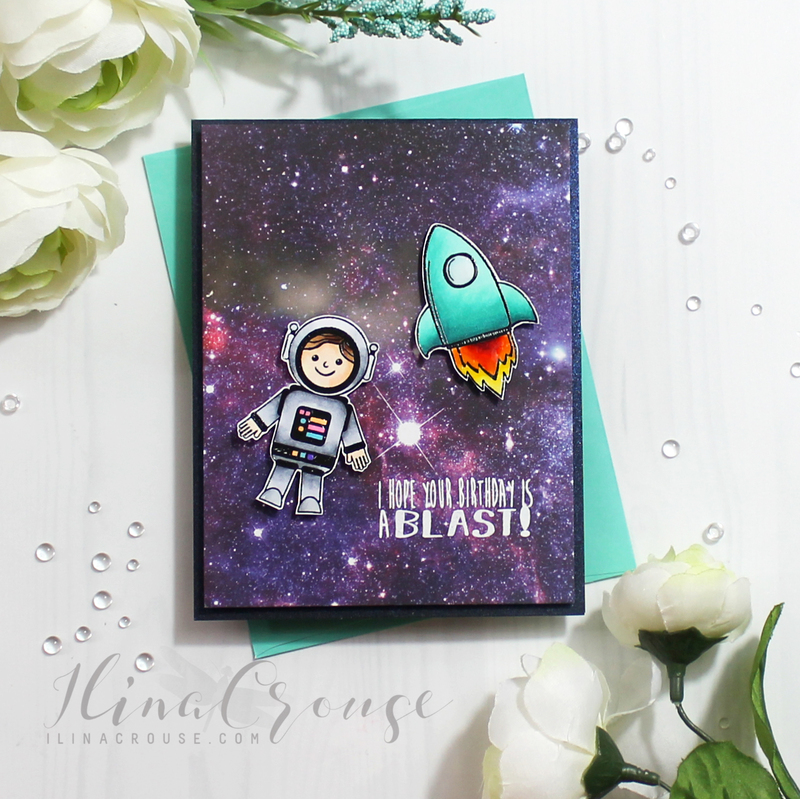 Love the space theme of this card! That is one FANTASTIC galaxy card!!! Fabulous card! I love this galaxy scene! Fun stamp set with the cute astronaut and rocket! That’s a fantastic card with a fantastic background !! I Just Love, Love , Love this! what a sweet card! Your card is awesome ! I love your sky, specially the huge star, it looks totally real. I know a futur astronaut (well, he's dreaming of being an astronaut.... until he finds a new idea - LOL !) who would love to receive such a beautiful card. Thank you for the inspiration.